In the Philippines, millions of people once again took part in the festival of the "Black Nazarene" in the capital Manila this year. The processions, carrying a 17th-century statue of Jesus, began on Tuesday. For the approximately two-kilometer-long route, which is covered, almost 22 hours were needed in 2017. Up to 20 million people were expected according to local media. There were high security precautions, because of feared Islamist attacks. The figure of Christ of the "Black Nazarene," a kneeling, cross-bearing Jesus, was brought from Mexico in 1606 to the Philippines by Spanish missionaries. The popular statue can be found in the Basilica of Quiapo, a district of Manila. This year's Traslacion was attended by at least 2.5 million devotees and lasted for 22 hours, according to police. 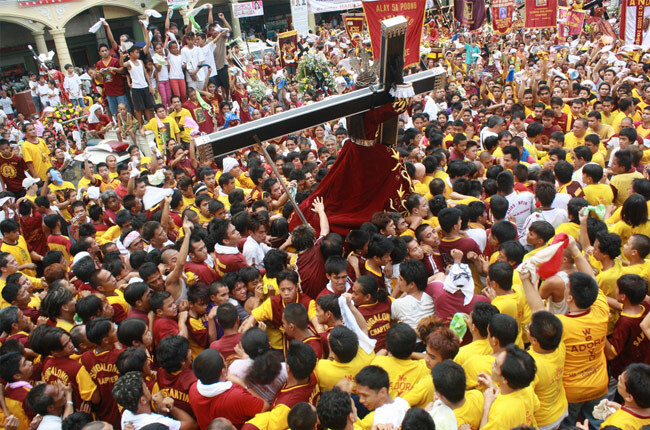 The Church has not reportedly launched a formal investigation into these supposed miraculous interventions of the Black Nazarene, but devotees continue to profess to the public and pass down stories that it holds divine power. Manila Archbishop Luis Antonio Cardinal Tagle, he said devotion shouldn't only end after the Traslacion and instead urged the faithful to nurture a deeper relationship with Jesus Christ. This tradition that dates back to the 1600 is an expression of collective faith, he said.